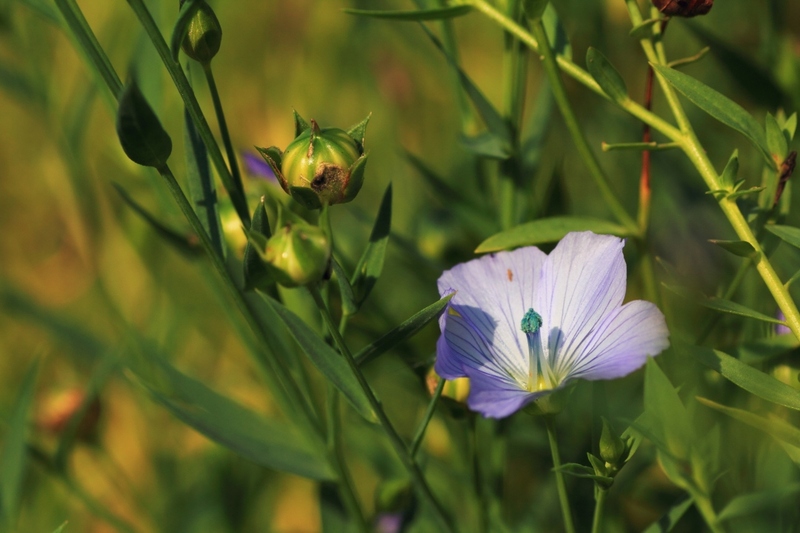 Flax (Linum): growing, planting, caring. Cute little flowers - we have a soft spot for the blue ones ! Linum - Flax - is a genus of approximately 200 species in the flowering plant family Linaceae, native to temperate and subtropical regions of the world. The genus includes the common flax (L. usitatissimum), the bast fibre of which is used to produce linen and the seeds to produce linseed oil. Flowers of most species are blue or yellow, rarely red, white, or pink, and some are heterostylous. 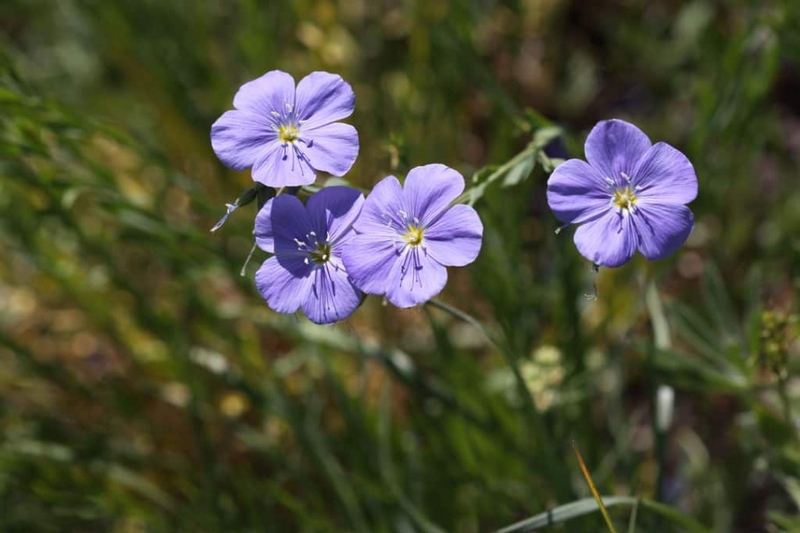 We’ll focus here on L. perenne - the perennial flax, blue flax or lint, and L. flavum, the golden flax or yellow flax. Inside: For perennial flax, it is better to sow in a shelter at the end of winter. Sow in pots, without over-covering the seeds in a seedbed, or a fine compost mixed with sand. Outside: Sow between mid-March and mid-April, in a well-drained soil, in the sun. Trace one or more shallow furrows - about 3 cm/1 inch deep. Arrange the seeds regularly and close the furrows. Water in rain. When the plants reach 5 cm, repot them in individual pots and keep them safe until the end of the frosts. You can plant your flax in the ground, but it will also be suitable for a large pot. - Plant in the sun or possibly in semi shade in poor and very draining soil, in May after frost or from September to November. Prepare the soil by a light digging - to decompact the soil without necessarily turning it upside down, with a pitchfork or a a scratching and a raking. Plant, keeping a spacing equal to the final height of the flax, if you want the clumps to appear individually, and half if you want a mass effect. Water thoroughly after planting. - In pots, plant in a mix of loam and sand, in a container pierced at the bottom, and equipped with a cup. If you have some on hand, add gravel, clay balls or other terracotta chips in the bottom of the container. After planting, add a "decorative" mulch - no rich mulch, the flax likes poor land! - around your plants. The choice is up to you, according to your tastes and what you have available. Crushed wood is suitable, or bark, or even a mineral mulch if you are looking for a rock effect. You can transplant your flax in the ground in spring or autumn. - Plant in the sun or possibly in semi shade in poor and very draining soil, in May after frost or from September to November. Prepare the soil by a light digging - to decompact the soil without necessarily turning it, with a pitchfork a scratching and a raking. Plant, keeping a spacing equal to the final height of the flax if you want the clumps to appear separated, and half of it if you want a mass effect. Water thoroughly after planting.